Today, many individuals who want to pursue a meaningful career in the health care industry are earning a Doctor of Nursing Practice (DNP) degree. 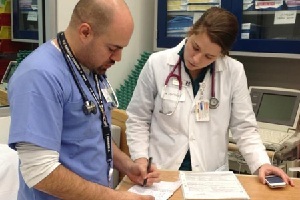 This is advanced degrees that can open doors to a variety of fulfilling careers within the medical field. Take a look at some of the most popular careers for individuals with this type of degree. A certified nurse midwife is responsible for helping a pregnant woman with her delivery as well as her prenatal and postnatal care. This professional educates pregnant women on the proper nutrition during pregnancy as well as what types of healthy exercise they can do while pregnant. Also, a certified nurse midwife is there to offer emotional support and encouragement to a woman while she is in labor. A certified nurse midwife may help a woman with a home birth or accompany her to the hospital so the birth can take place there. A growing number of pregnant women are hiring certified nurse midwives so they can have a knowledgeable partner throughout their pregnancy. This occupation is popular with many health care professionals who have a DNP degree because it allows them to take on many of the same responsibilities as a traditional medical doctor. For instance, a nurse practitioner can prescribe medication, treat illnesses and interpret lab results. He or she also educates patients on healthy eating habits and proper exercise. If a nurse practitioner sees a patient who needs the advice and treatment of a specialist, he or she is able to make a referral. Some individuals with a DNP degree pursue work as a college professor. They lecture nursing students on a variety of topics such as the methods of nursing care, current medications, and advances in medical equipment and ethics in nursing. Individuals who teach nursing students are helping to improve the overall quality of nurses working within the profession. That benefit makes this occupation very appealing to people with a DNP degree. Finally, many individuals with a DNP degree opt for a career as a nurse anesthetist. These professionals administer anesthesia to individuals who are undergoing surgery. A nurse anesthetist must monitor a patient’s blood pressure and breathing during the surgery. Also, this professional must ensure that a patient is healthy enough to be under anesthesia before the surgery ever begins.